A roundup of great long-form journalism from over the years — and what makes them so memorable. Most education reporters yearn to write memorable stories, the ones that go beyond the routine, make a deep impression and stick in readers’ minds. But what makes for one of those standout stories? In an attempt to answer that question, The Grade asked education journalists and others for their personal favorites. Those who answered provide more than a list of outstanding reading and listening material. Their responses show what spectacular pieces of education journalism tend to have in common. Almost all of the stories examined topical issues in education — racial, economic and gender disparities, dropout rates, high-pressure testing, gun violence and trauma — through a personal prism. They relied less on talking heads and more on the people living the stories. They avoided simplistic representations of these people or the issues they faced, leading to deeper understanding and empathy among readers. Three of them are investigations that revealed in unsparing detail wrongdoing by school administrators that cheated students of their right to a decent education. Wrong Answer, by Rachel Aviv, published July 2014 in The New Yorker. Nominated separately by Danielle Dreilinger, Knight-Wallace Fellow, and Mario Koran, California correspondent at The 74. 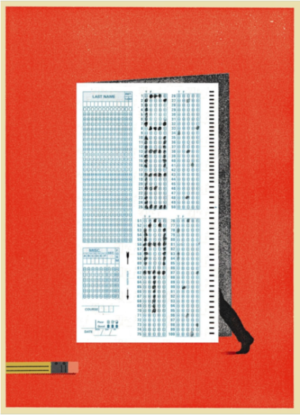 The New Yorker story describes how, under tremendous district pressure to raise student test scores, educators in the Atlanta Public Schools system cheated on state-administered standardized tests by changing students’ wrong answers. When the full breadth of the systemic cheating was uncovered in 2011, it was labeled one of the largest cheating scandals in U.S. history. Aviv tells the story of the educators who participated and perpetuated the cheating at Parks Middle School in Atlanta and zoomed in on two in particular: Damany Lewis, a math teacher, and Christopher Waller, the school’s principal. The resulting story revealed teachers’ inner conflicts and added nuance, empathy, and understanding of how matters spiraled out of control. A feature movie based on Aviv’s story is in the works. ‘It’s Like You’re Climbing Everest’ by Erika Hayasaki, published February 2006 in the LA Times. Nominated by Linda Shaw, western region manager at the Solutions Journalism Network. “The scenes in that story have stuck with me, and still break my heart,” Shaw said. Hayasaki’s series on high school dropouts followed a group of 11 boys who called themselves the Outsiders and whose families immigrated from Mexico and other parts of Latin America. They entered Birmingham High School together in Los Angeles in fall of 2001. By late spring of 2005, only four of the 11 were still enrolled. In one scene, Hayasaki follows the Outsiders to what they had hoped would be their own high-school graduation. That scene, 12 years later, still sticks with Shaw. In “The Problem We All Live With,” Nikole Hannah-Jones follows two school districts in Missouri that in 2013 experienced an accidental desegregation program. 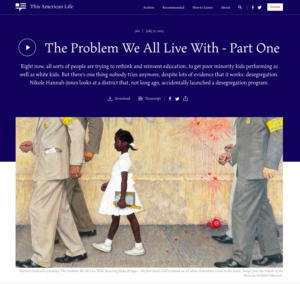 The Problem We All Live With, by Nikole Hannah-Jones, aired July 2015 on This American Life. Nominated by New York Times reporter Farah Stockman. In this much-admired episode, Hannah-Jones follows two school districts in Missouri that in 2013 experienced an accidental desegregation program. Through a glitch in state statute, students from Normandy High, the majority black, low-performing school that Michael Brown attended, were allowed to take a bus 30 miles away to Francis Howell, in a wealthy and majority white district. The piece follows a student from Normandy High whose mother is on a quest to find her daughter a good education. We sit in on them discussing transferring at the kitchen table. We hear white parents saying they don’t want their district to enroll students from Normandy High School. The Grade takes a deeper look at education journalism. Sign up here for the free weekly newsletter. No Child Left Behind by Stephanie Banchero, published July 2004 in the Chicago Tribune. Nominated by Greg Toppo, a senior editor at Inside Higher Ed. In this series, Banchero follows 9-year-old Rayola Cardwell, a student from the South Side of Chicago who is allowed to transfer to a better-performing school across town thanks to a provision in the federal No Child Left Behind Act. Harper High School by Linda Lutton, Ben Calhoun, and Alex Kotlowitz, aired February 2013 on This American Life. Nominated by Spencer Fellow Kalyn Belsha. “I’ve used this story many times in my reporting classes because of the masterful way it introduces its topic,” Belsha said. The topic examines the ways in which Chicago students are affected by gun violence in their city. Based on five months of reporting, the story opens on the first day of the school year, when Harper High Principal Leonetta Sanders calls for a moment of silence during the back-to-school assembly to honor students who had been shot the previous last school year. In fact, 29 recent and current students had been shot that year, eight of whom died. Failure Factories, by Cara Fitzpatrick, Lisa Gartner, and Michael La Forgia, published in 2015 in The Tampa Bay Times. Nominated separately by Education Week reporter Evie Blad, the Houston Chronicle’s Mónica Rhor, and the Solutions Journalism Network’s Linda Shaw. The piece “deconstructs how and why schools are failing students of color,” Rhor said. Nearly 30 years later, “The Cookie Monster of P.S. 224” by LynNell Hancock stands the test of time. The cookie monster of P.S. 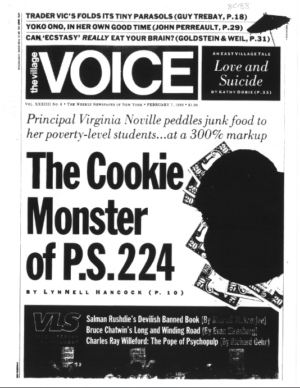 224, by LynNell Hancock, published February 1989 in the Village Voice. Nominated by Sam Freedman, former education columnist for The New York Times and a professor at Columbia University. Nearly 30 years later, “The Cookie Monster of P.S. 224” stands the test of time. Although it has not been archived online by the Village Voice yet, Investigative Reporters and Editors members can order Hancock’s story here. The Wiz, by David Finkel, published June 1993 in The Washington Post. Nominated by former Tampa Bay Times reporter Cara Fitzpatrick. It opens during Elizabeth’s third-period quantum physics class, in which six boys talk loudly and confidently about “the failings of Euclidian geometry,” and Elizabeth – the only girl in the seven-person class – waits for her moment to interject her idea into the discussion, eventually doing so by turning her statement into a polite question. Three Miles by Chana Joffe-Walt, aired March 2015, produced by This American Life. 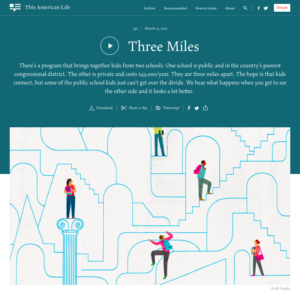 Three Miles by Chana Joffe-Walt, aired March 2015, produced by This American Life. Nominated by Sara Mosle, editor at Chalkbeat Newark and New York Times contributor. “I remember hearing this piece and just sitting in my car afterward stunned and overwhelmed, thinking it was unlike anything else I’d ever read or heard,” Mosle said. In it, Joffe-Walt looks back 10 years later on a 2005 program that brought together a group of students from two New York City high schools just three miles away from each other in the Bronx: University Heights High School, a public school, and Fieldston, an elite private school. The episode focuses on a University Heights student named Melanie who disappeared soon after the University-Fieldston program began. Celebrated school accused of cheating; Exclusive: TAKS results too good to be true at Houston elementaries, Joshua Benton and Holly K. Hacker, published December 2004 in the Dallas Morning News. Nominated by Eva-Marie Ayala, an education reporter at the Dallas Morning News. At Houston’s Wesley Elementary “desperately poor students outscored children in the wealthiest suburbs.” This is the school that George W. Bush and Oprah Winfrey visited in the 1990s and upheld as an example for others to follow. But a data investigation by a team at Dallas Morning News found evidence that much of that success came from widespread, systematic cheating. Analyzing Texas’s 7,700 public schools test scores, the newspaper found unusual gaps in scores from 2003 to 2004 in nearly 400 schools. Former teachers and an ex-principal revealed what was the data said – cheating was widespread. Against All Odds: In Rough City School, Top Students Struggle to Learn, Escape, by Ron Suskind, published in May 1994 in The Wall Street Journal; nominated by Lori Crouch, assistant director for the Education Writers Association. The student voices allow readers to understand the obstacles for students of poverty and to see how Phillip, who could easily be tagged as a bully, is trying to get by in a place where people tell him he won’t amount to anything. If you have your own favorites to add to this list, please send them along; it’s inspiring and instructive for all of us to learn from the best. Kristen Doerer is a freelance journalist, based in Washington, DC. Follow her on Twitter @k2doe.